Anyone from the Chicagoland area remember the Ray Raynor Show? It was a delightful show for children way back when, And it had valuable lessons. My favorite memories are of his cooking a Thanksgiving turkey and when he showed craft projects for the kids. What made it so special? And hilarious? He always managed to mess up in some way. He would start off with a golden brown turkey or a pretty Mother’s Day craft. And whether it was trying to stuff the turkey upside down or adding too much glue to the craft project and ending up with a gooey mess, he entertained and gave good messages. He allowed children to be children. To let them know that it’s okay if something doesn’t come out just “perfect”. He got down to their level. It seemed to me to be a show for adults as well as the children. 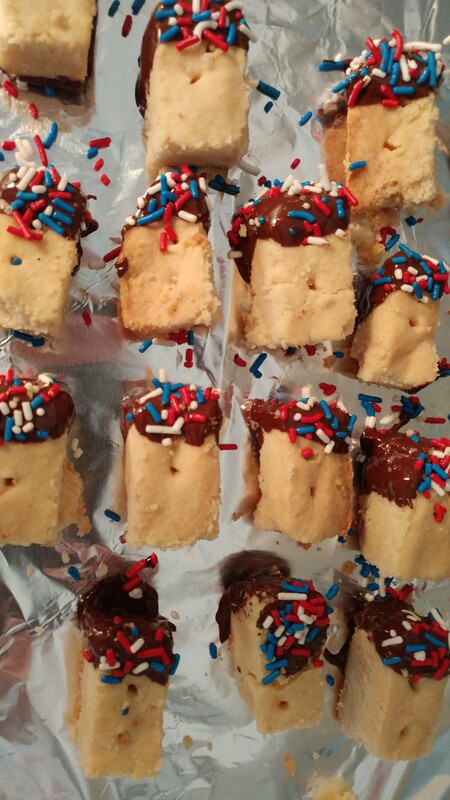 What does that have to do with Red, White, and Blue Shortbread Cookies? Well, I thought of the Ray Raynor show several times while making the cookies. I just kept running into snags. 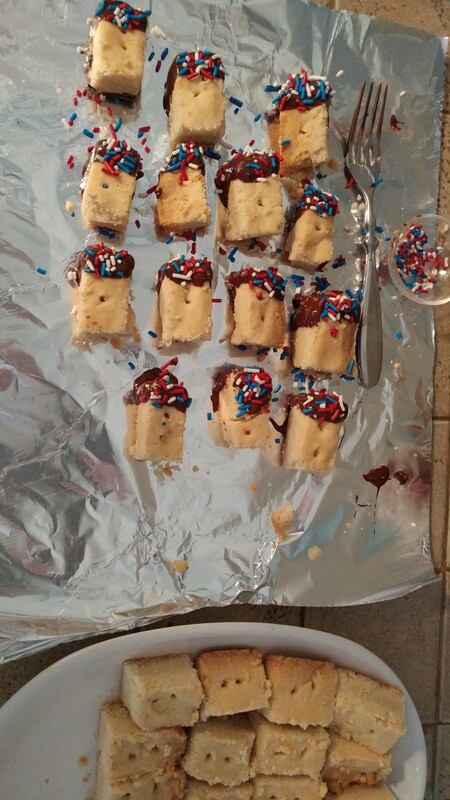 They were delicious but the recipe didn’t exactly cooperate. Partly my fault. 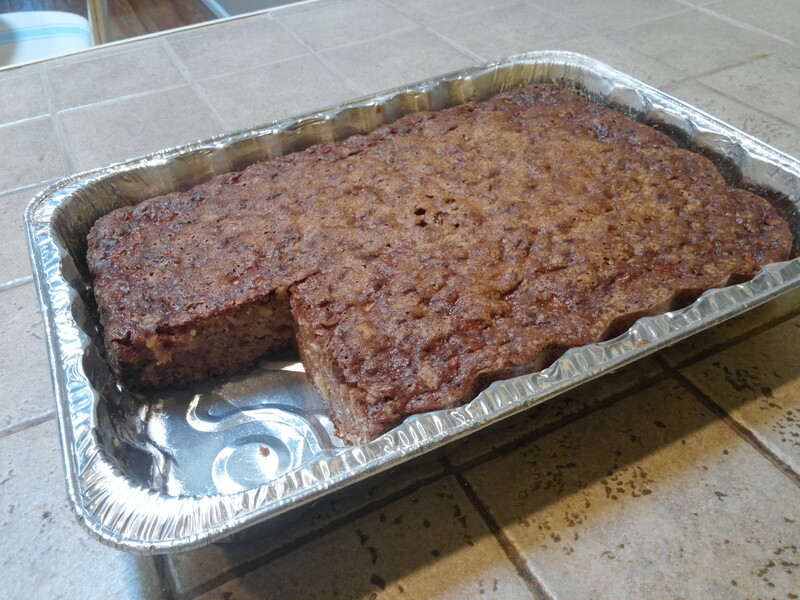 It called for an 8×8 square glass pan. 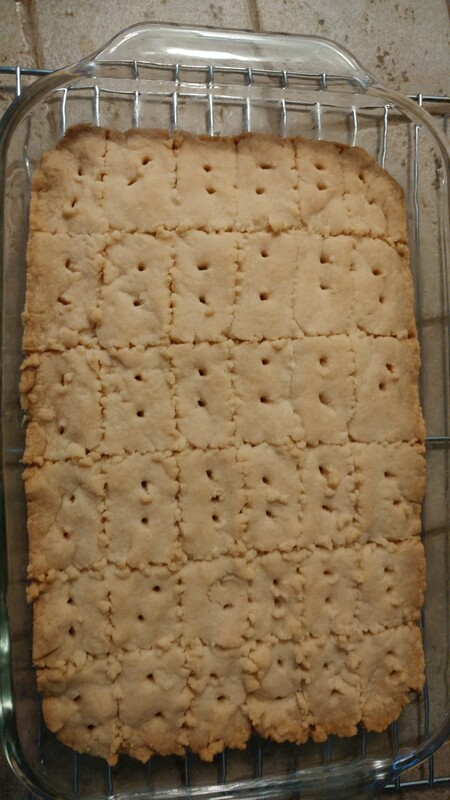 I didn’t have one so I increased the recipe by half again and put it in an 8×11 glass pan. The only real problem with that actually is the rounded corners. The cookies weren’t exactly squared off. 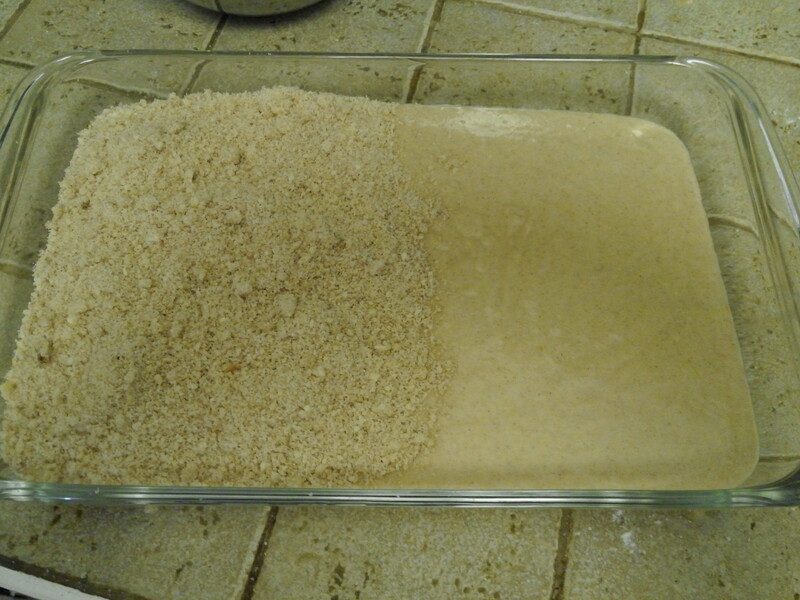 I was short 1/4C sugar so I added some Equal. That was no big deal. They baked well. 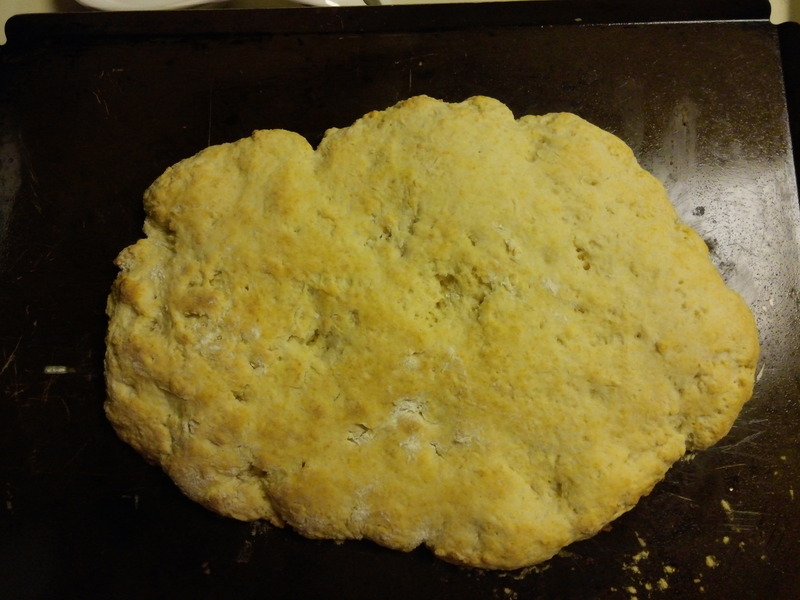 It took a little longer, of course, because of the change in pans and quantity of the dough, but that was okay too. Then it came to the dipping the cookies in the chocolate and adding the sprinkles. It’s possible I bought the wrong chocolate, although none of the chocolate was listed as dipping chocolate. At any rate, I had a mess, I had chocolate dripping everywhere and so when I needed to add the sprinkles before the chocolate hardened, I ended up with sprinkles everywhere as well. I had to chuckle and thought of Ray Raynor. Thank you Ray. 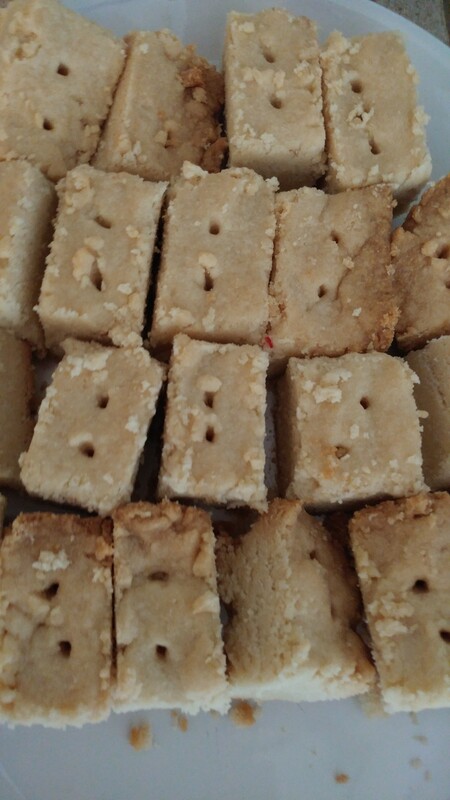 I have added a link to the original cookie recipe that I found on Pinterest. I do hope you will give them a try and learn from my mistakes. And if they don’t end up “perfect” give a smile and a nod to the Ray Raynor Show. 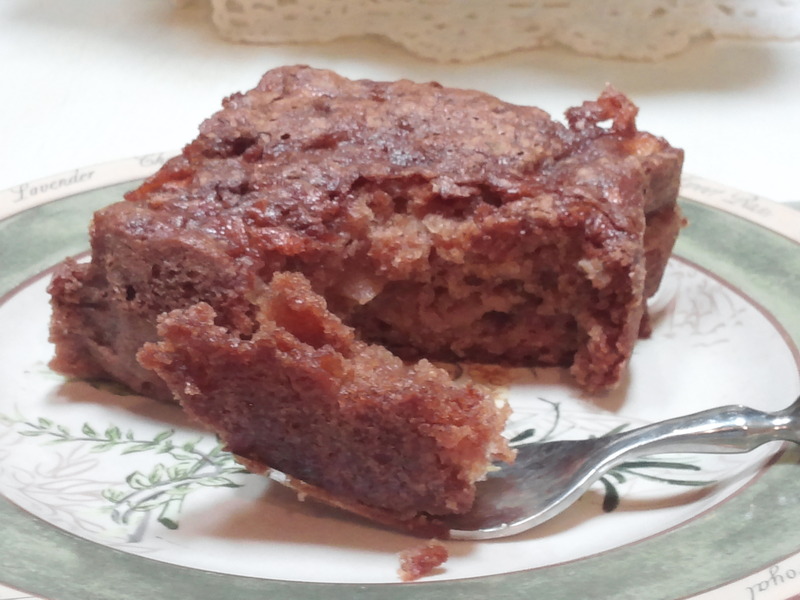 This is an old apple cake recipe. 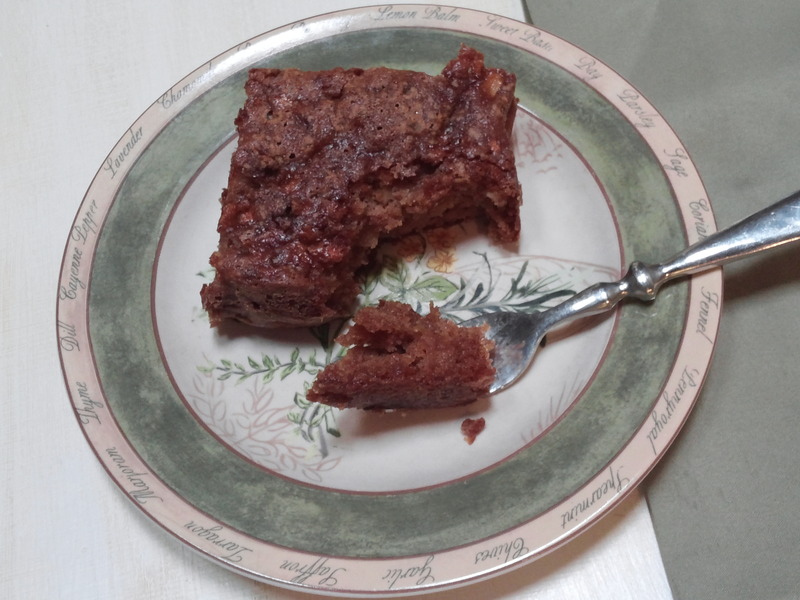 Not a cake made from old apples, but a recipe that I have had for a very long time. Not really sure where I got it. I think it was some time around the time that I was a member of the West Chicago Mothers’ Club. I usually make it about once a year. 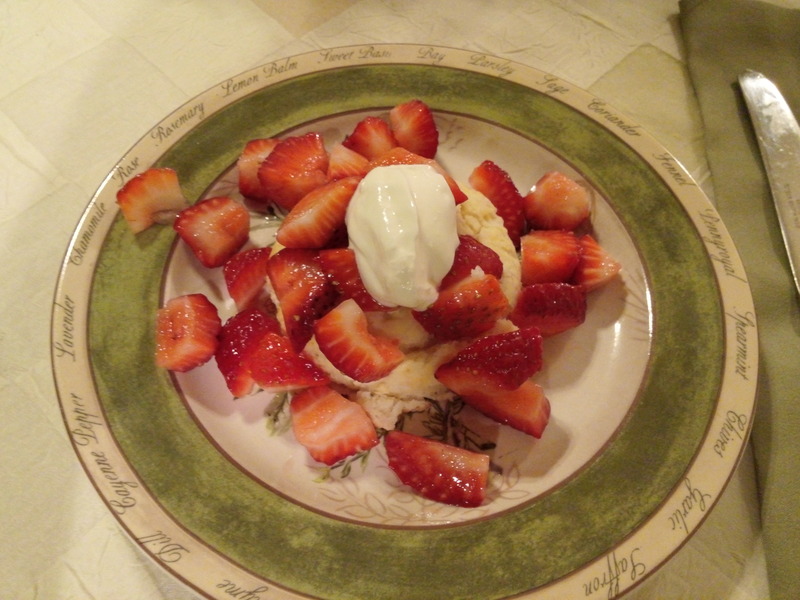 It is not exactly a quick recipe but is so worth the time. 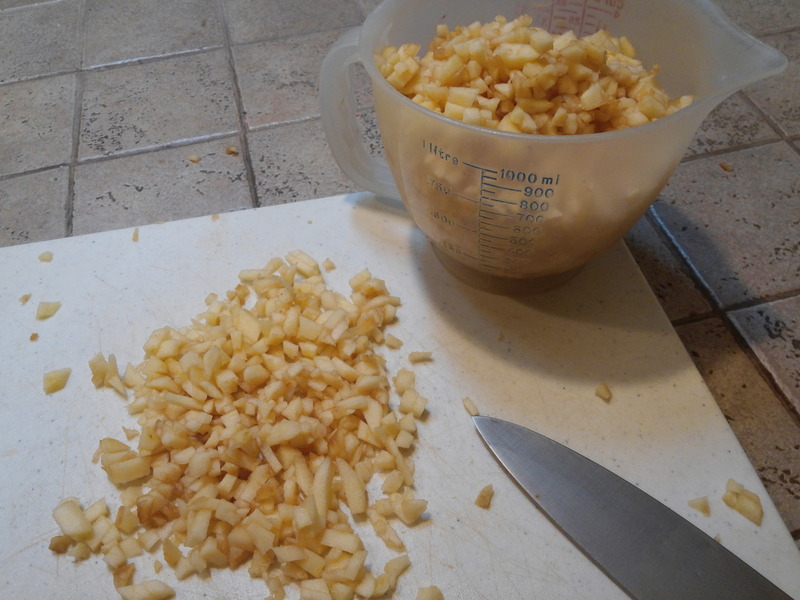 It doesn’t take forever, it’s just that I am not a fan of peeling and chopping apples. But it is the thought of the results that make it worthwhile. 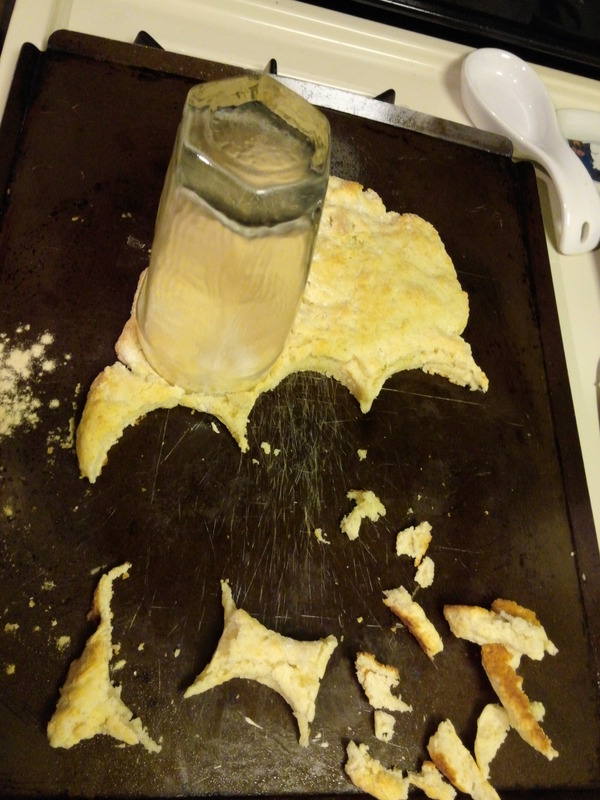 Cream sugar, shortening, & eggs (one at a time). Add rest of ingredients. 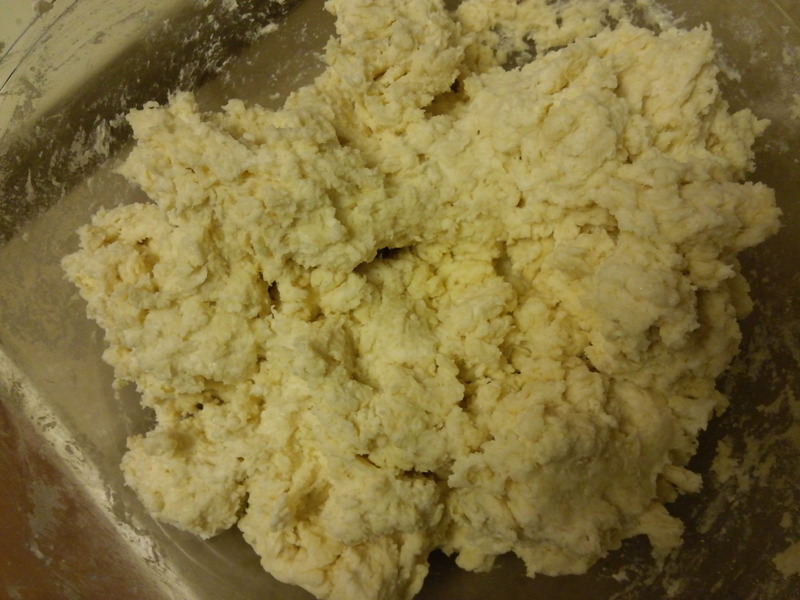 Pour into greased and floured 9×13 pan. As far as the apples go I usually buy whatever tart ones that happen to be on sale. How many make up 5cups? It varies depending on the size of the apples of course. I tend to buy a bag of them. Sound easy enough? It really is. Just a little time consuming, chopping apples and all. 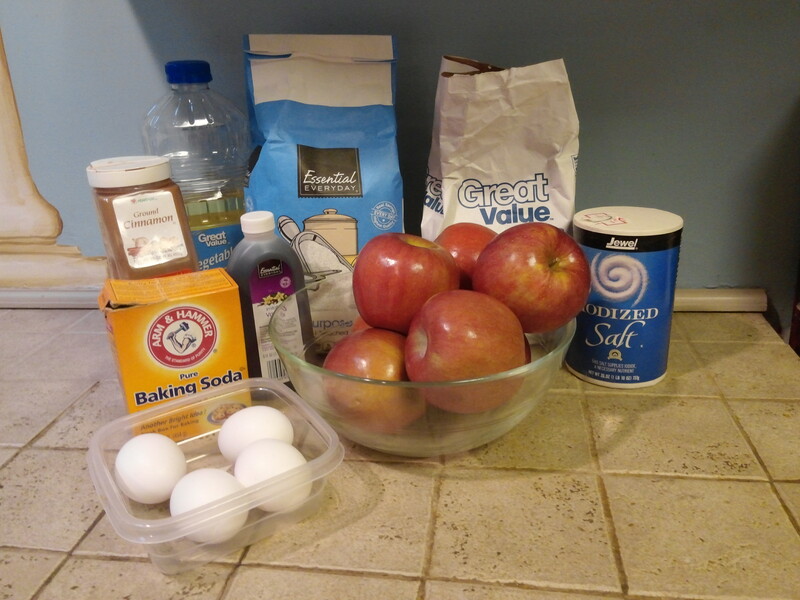 Every year at this time I get the urge to make Apple Cake. It’s Fall again! Time for beautiful colors, cool mornings, and crisp apples. Oh, yes, and a bit of news! My application to take part in the Morris Three French Hens Market on October 11th has been approved. Another great market to get ready for! 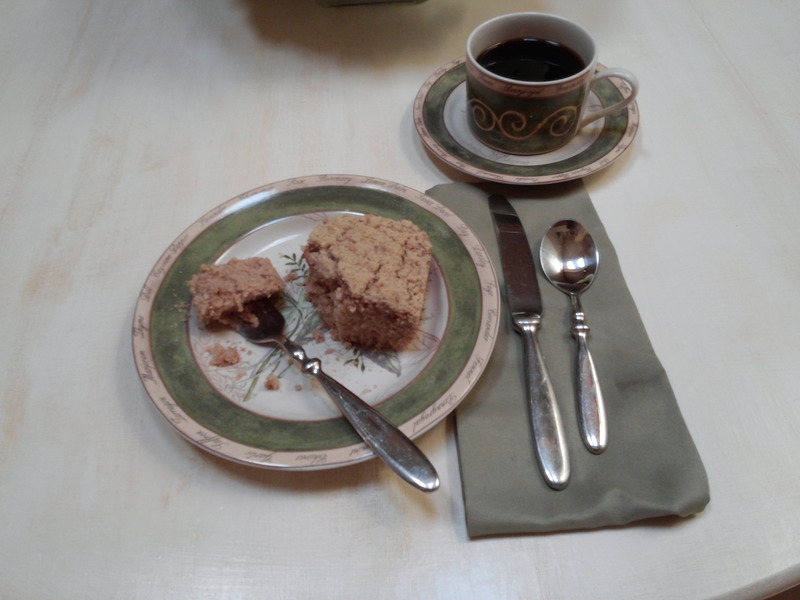 A Father’s Day treat, one of my mother’s treats…….call it what you will, this quick and easy little coffee cake really hits the spot. 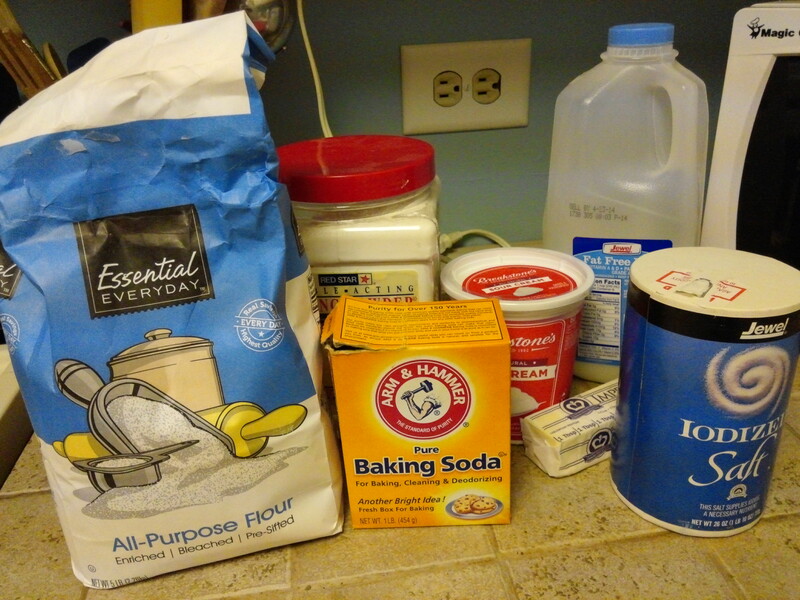 One of the best things about it is that it uses ingredients that you most likely already have in your kitchen. 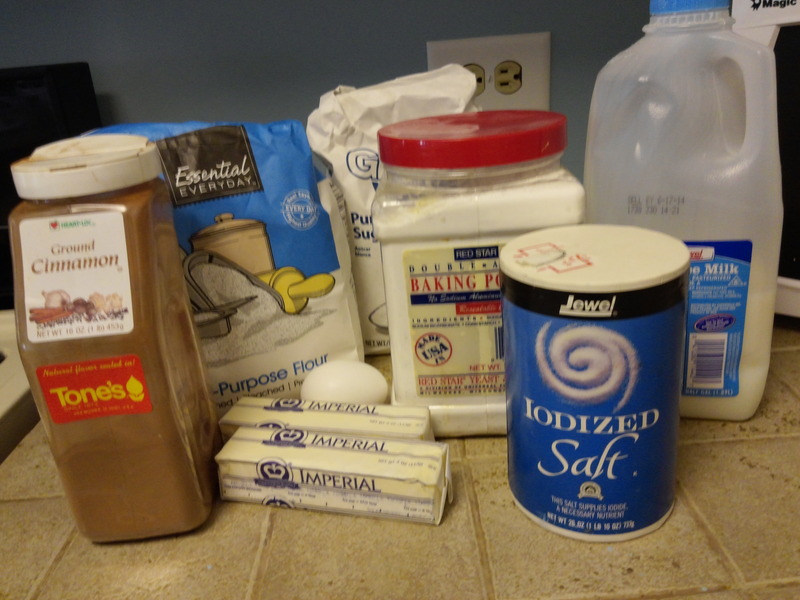 Mix first 4 ingredients plus cinnamon (I find about a level teaspoon is a good amount). Save 1/3 for the topping. To the remaining amount add the egg and milk. Beat until smooth. Pour into a square or round pan. Sprinkle the topping over it. 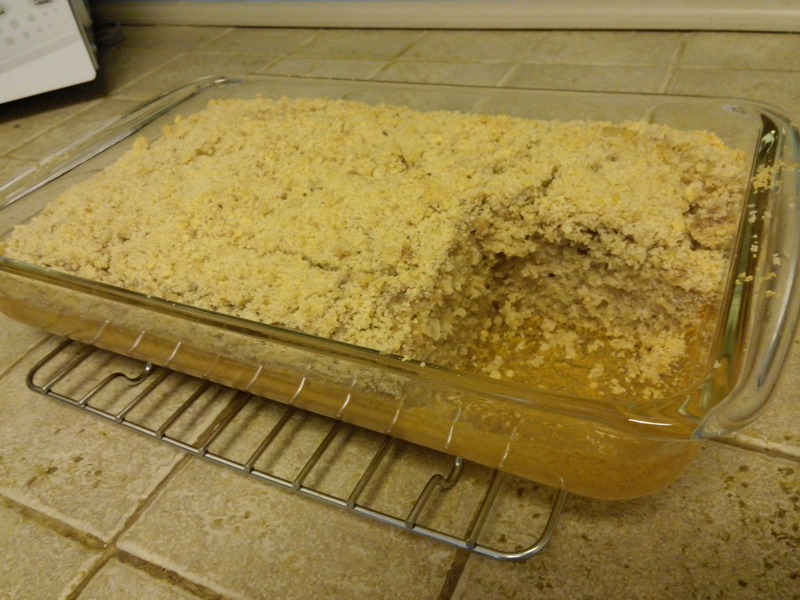 I usually double the recipe and put it in an 8×11 pan. Of course, it will need to bake a little longer. And a Happy Father’s Day! Did the name catch your eye? 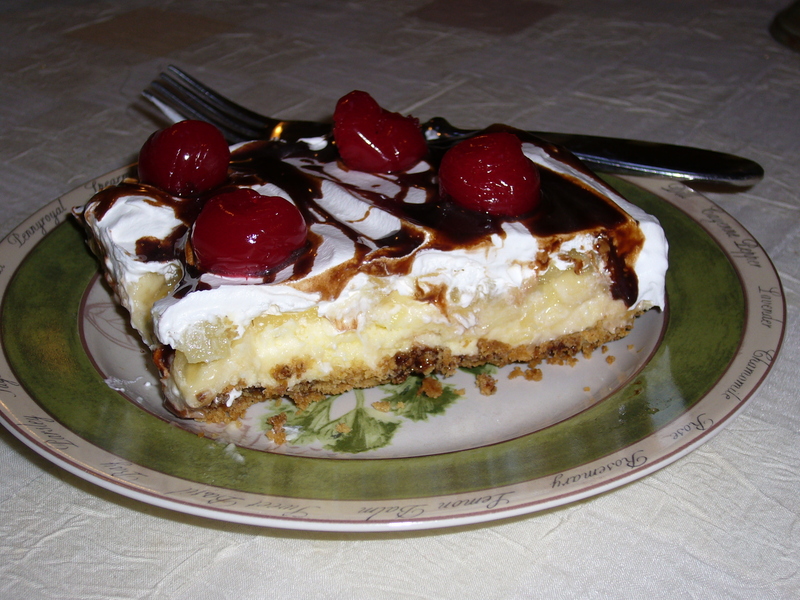 This is a delicious and fun recipe to serve. My mind must be on sweets because of Valentine’s Day coming up. At any rate, I haven’t made this recipe in a long time. I was first given it by a friend when my children were young and I was a member of the West Chicago Mother’s Club. We would all exchange recipes and childrearing ideas. We also had put on a yearly Halloween parade and run a well-child clinic once a month. It was a good group and I have alot of fond memories from that time. Enjoy the recipe! I have also found it to be a good conversation starter. 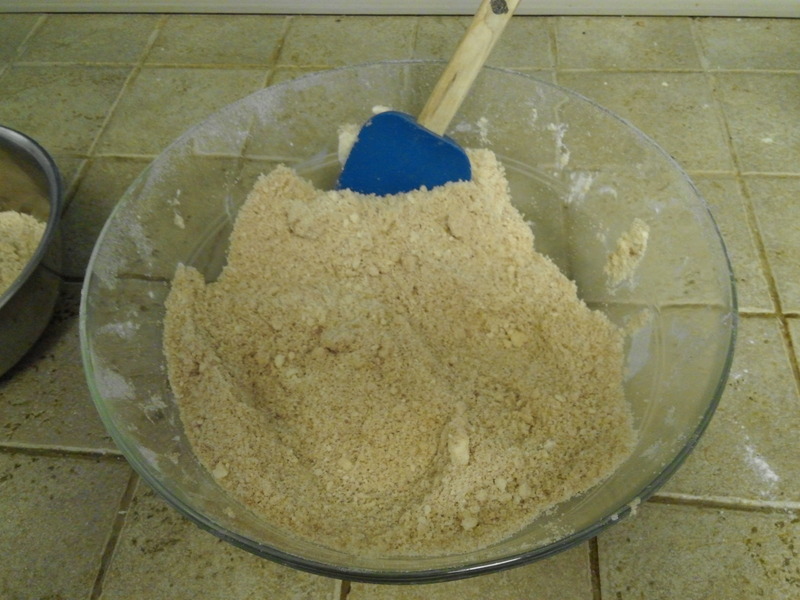 Combine first 2 ingredients, pat into a 9x13pan. Bake at 350 degrees for 10 minutes. Drizzle chocolate over it when cooled. 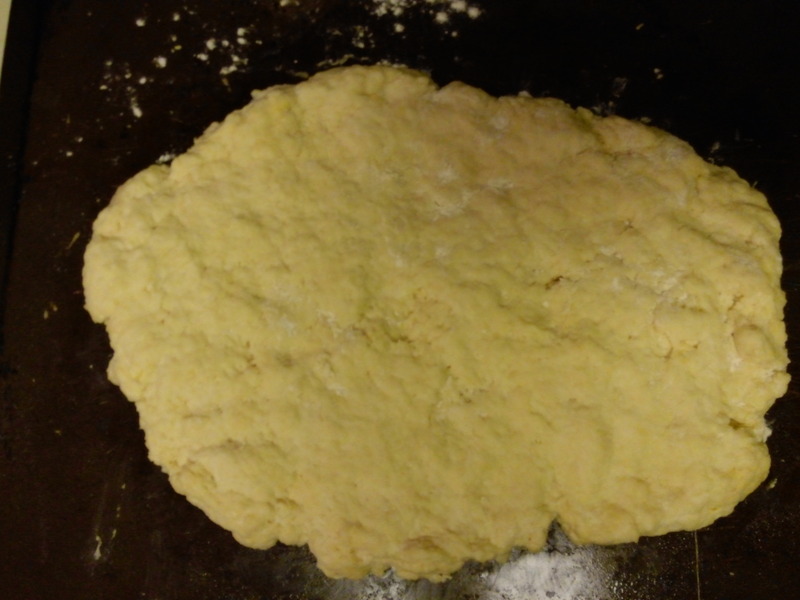 Combine next 3 ingredients and beat until fluffy. 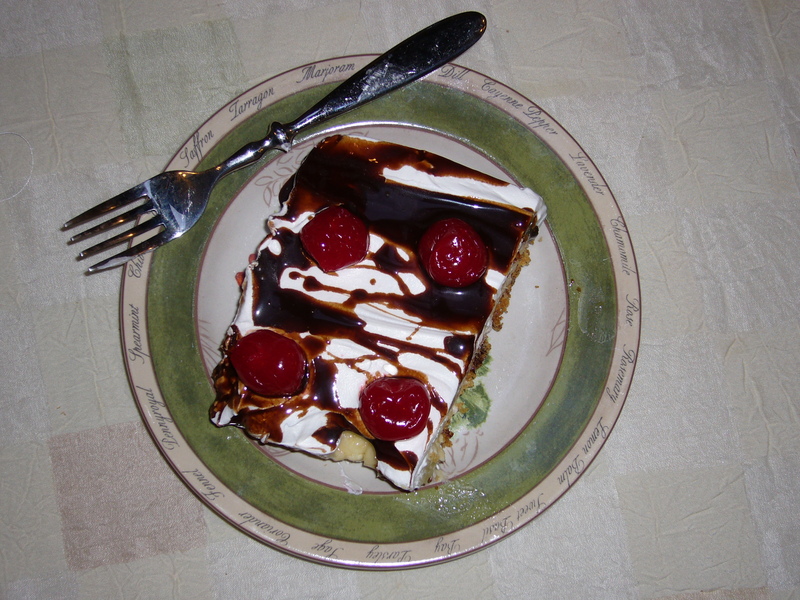 Spread this evenly over the chocolate syrup. 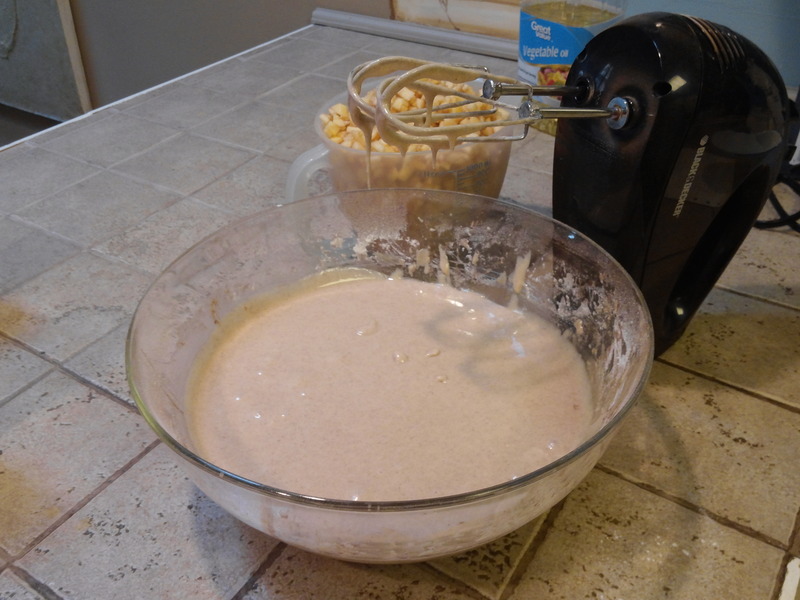 Arrange bananas over the butter mixture. Top with pineapple. 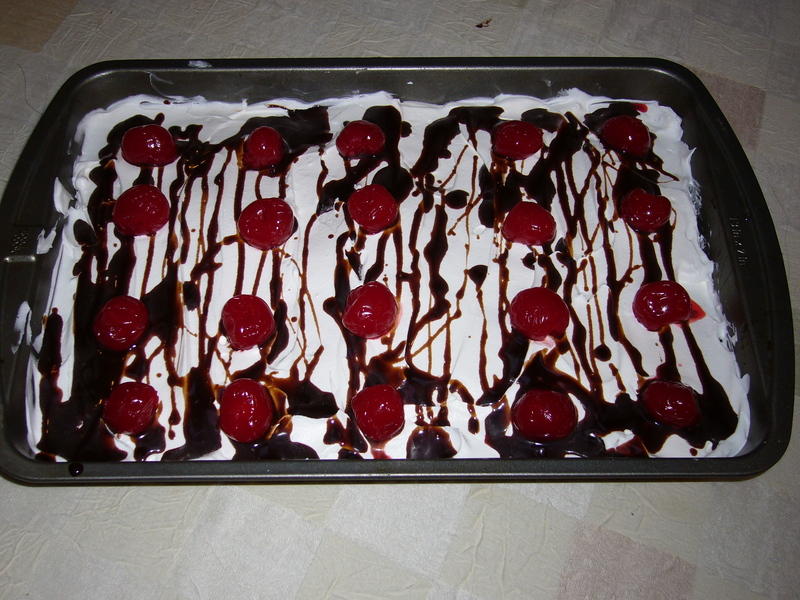 Cover with Cool Whip. I am not very tech savvy, although, to my credit, I have come a long way since starting this blog. It is being a fun and challenging journey. If I am ever late in getting a blog out it is either because I am having technical difficulties (which is really the biggest reason) or I am sick in bed. Have a great day and by all means, Stay Warm!